The above picture shows two examples of the mineral wavellite: an aluminum phosphate mineral prized by rock and mineral collectors and fairly common in the Ouachita Mountains. 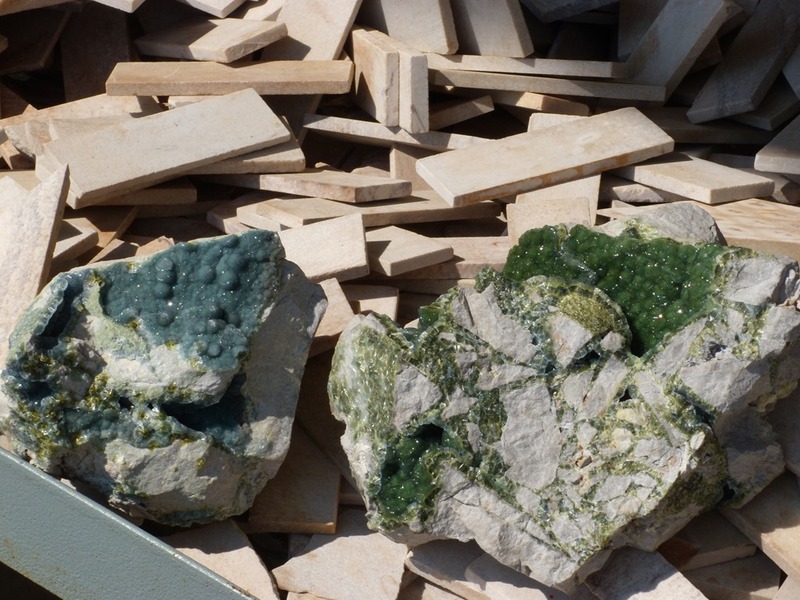 The green sample on the right is the typical color of wavellite, whereas the blue sample is a rare form. The green color is due to the presence of vanadium. These samples were both collected from an abandoned quarry a couple of miles northwest of Mt. Ida, Arkansas. It’s easy to see why mineral collectors would be interested in wavellite as it comes in a variety of attractive colors – rarely white, yellow and black in addition to the blue and green examples shown here. It also has a visually interesting growth habit; it grows in botryoidal (grape-like) spheres that internally consist of a radiating array of slender crystals that resembles an eye. Examples of this eye-like structure can be seen by clicking on the “more views” link below. Wavellite is also quite sparkly and Christmassy. I even hear it’s the official mineral of the north pole. Ho ho ho! This entry was posted in #geoblog, GeoPic of the Week and tagged #geoblog, Arkansas, botryoidal, christmas, crysatals, Geology, mineralogy, Ouachita Mountains, wavellite on December 23, 2014 by argeology.